New Jersey's Atlantic coast is a popular vacationland. Escapees from New York City and other hectic urban environments seek out relaxation in seaside towns like Cape May, with its plentiful Victorian Bed and Breakfasts and its pleasant beaches. Thrillseekers from all over flock to Atlantic City, with its casinos, its boardwalk, and its entertainment venues. 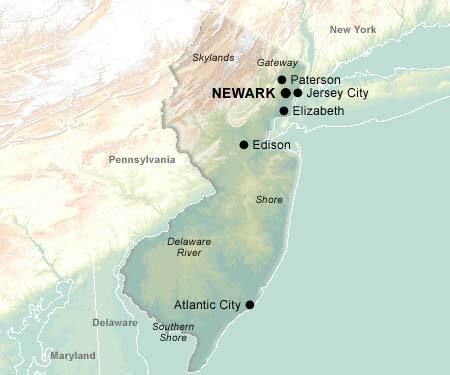 The northeastern industrial corridor of New Jersey, on the approach to New York City, doesn't have the picturesque beauty of the coast, but it has many of its own attractions. The Newark Museum has a world-class fine art collection. The Meadowlands, a gigantic sports and entertainment complex in East Rutherford, is the home of Giants Stadium, and hosts concerts, touring shows, the US Open, and miscellaneous other events every year. The Thomas Edison National Historic Site in West Orange preserves the inventor's magnificent home and laboratory. New Jersey has the highest population density in the US -- over 1,100 persons per square mile, compared with a national average of 80. Yet the state still has lots of small towns with their own irresistable charms, such as Princeton, home to Princeton University, and Morristown, where Washington's army wintered twice during the Revolutionary War. They're worth trips of their own; then when you decide you want something grander, New York City is just across the Hudson River. © 1995-2002 Online Highways, LLC. All rights reserved.